Read Right, a truly extraordinary reading intervention program, constitutes a paradigm shift in the field of reading. In other words, Read Right employs methods never before attempted, and indeed, participants in Read Right obtain results never before accomplished. Reading ability and reading comprehension improve rapidly. When an individual learns how to do something, he builds a network to guide the doing of it. The root cause of every reading problem is a network built to guide the act of reading that has been built incorrectly. When accessed to make reading happen, this network yields less than excellent reading. Read Right methodology compels the student’s brain to remodel the neural network so it yields excellent reading every time it is accessed to make reading happen. When reading out loud, sounds natural, like conversational speech. The plasticity of the brain allows the remodeling to happen, but the environment must be precise to enable the brain to figure out what it must do and to compel it to do the work. Read Right methodology constructs an environment that does precisely that! We are basically unleashing the power of the brain to do what brains do. The goal for Read Right students is not to foster incremental improvement. Rather, we are realistically looking for a quick, complete, and permanent elimination of the reading problem. To understand more fully how the Read Right Program is significantly different from other reading intervention programs, visit the Theoretical Constructs page of this web site. Read Right has had demonstrated success with students of all ages–children, teens, and adults–no matter what label they wear. Participation in Read Right has transformed special education students, English language learners, RTI students (both tiers 2 & 3), title one students, and students who have no labels but don’t read as well as they would like to be able to. Advanced Placement students have voluntarily entered our programs because they are not totally excellent readers as manifested in excessive time spent on homework. Read Right is effective for anyone whose brain is not already reading excellently. Read Right has been successfully implemented in urban schools, rural schools, schools primarily serving Native-American students, schools with large Latino-Latina populations, schools serving significant number of African-American students, and in alternative schools. Read Right provides everything required for a successful implementation. Norm-referenced, standardized reading test to be administered pre-Read Right participation and post-Read Right participation to serve as a summative evaluation of project results. Intensive off-site support during the entire school year for on-going quality assurance and collaborative problem-solving when Read Right consultants are not on site doing training. In addition, and most importantly, Read Right provides multiple weeks of intensive, hands-on training for up to four staff members (teachers or instructional aides in any combination) for both the Read Right Small-Group Intensive Intervention and the Read Right Whole-Class Intervention. The live, real-time tutoring in the Read Right Online delivery system is provided by highly-trained Read Right employees. (Therefore, no training of your staff is needed.) Three students can be served at one time (one POD) via video conferencing. 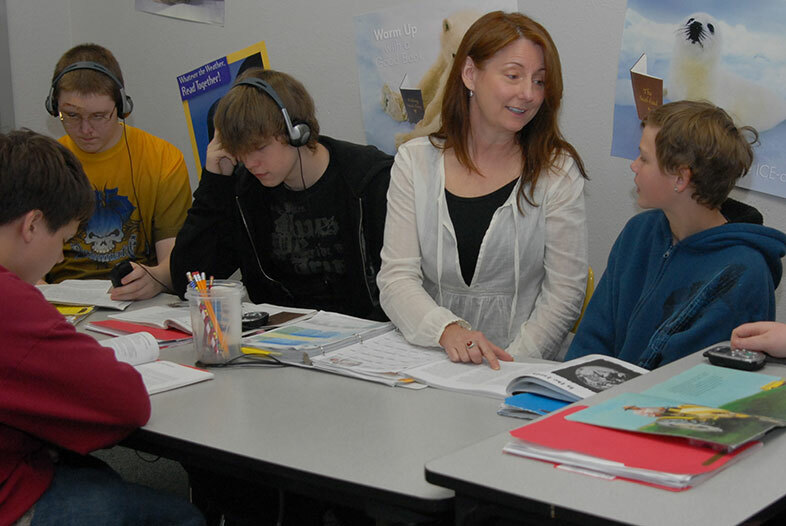 Each student needs access to a computer and a headset with attached microphone. Clients can purchase as many PODs as they wish. Read Right has multiple data sets attesting to the effectiveness of its programs. Gold-standard, independent research completed by Education Northwest and funded by the Sherwood Foundation has documented the effectiveness of Read Right. The summative evaluations show a consistent pattern of gain scores that far exceed expectations as established by the US Department of Education and as established by numerous individual school districts. Numerous data sets that show significant and unexpected gains on the reading portion of state tests. Visit our data page for more detailed information. For data generated by Native American Populations, click here. We encourage interested educators and researchers to speak directly with school administrators, teachers, and aides who are using Read Right to improve student reading ability. We welcome requests for reference lists and we invite you to listen to a few video testimonials below (many more video testimonials are available in our Video Library). John Berry is a former pro-football player and a current high school principal in Texas. He confirms that Read Right works with all ages of high school students who are not yet excellent readers, including special education, general education and advanced placement students. He sees strong parallels with how athletes develop their skills and how the Read Right Intervention programs advance students’ reading abilities. Marti Hines is a member of the school board in Bridgeport, Texas and a retired teacher and principal. She speaks to the effectiveness of Read Right’s intensive staff training and to the “amazing” results she has witnessed with the program. She appreciates that the Read Right approach is different from any other intervention program. Nancy Louis has been trained as a Read Right Trainer for Mariana Bracetti Academy in Philadelphia, Pennsylvania. She shares her experiences in witnessing the effect on behavior and discipline issues when students are transformed in their reading abilities through participation in Read Right. Amy, a first grade teacher, and her daughter Maddy explain how devastated Maddy was when she wasn’t able to read in first grade and how her childhood was disrupted by the frequent need to spend 3-4 hours helping her with homework. Once participation in Read Right resulted in a significant improvement in her reading, she could do her homework in a timely manner in her room by herself. She was now able to play with her friends after school, like all children should. Dr. Vic Rucker is principal of the Secondary Reassignment Center, which is part of the Irving, Texas Independent School District. He sees students for an average of 20-30 days and then returns them to their home schools. Altogether, he sees about 1,000 students per year. Each one is referred for discipline issues, and he finds that poor reading skills are often the root of their poor behaviors. Because Read Right works so quickly to transform reading abilities, he finds that his students often progress 1-2 years in the 20-30 days they are at his school and that this kind of growth can make it possible for them to participate in the life of their home schools.